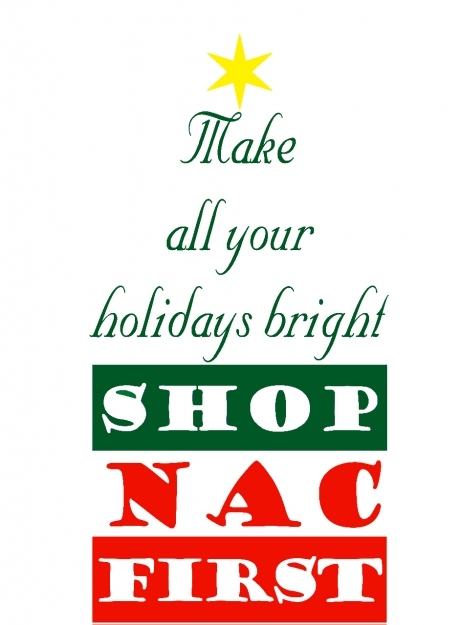 Shop Nac First for the Holidays! Exercise your power to support the growth of your community when shopping for the holidays by purchasing as much as possible from Nacogdoches County businesses, large and small. The Nacogdoches County Chamber of Commerce is encouraging all to "do business with your neighbors" and "shop local!" he Chamber is working with community partners and local businesses to revive the Shop Nac First campaign, and all are invited to check out the new www.ShopNacFirst.com site produced by the City of Nacogdoches. Find videos that entertain as well as inform, fun graphics and some really interesting data about the results of purchasing products and services from your fellow Nacogdoches County neighbors. By making this simple choice, you will make a major impact in the place where you live and work. We all share benefits when we shop local.